The surgeon(s), anesthesiologist, scrub nurse, circulating nurse, the surgical techs, and residents stand in the surgical suite. Also in the room is a patient prepared for surgery. The team is going to amputate his lower left leg because he has complications from diabetes. Before performing the procedure, the surgical team forms a huddle to review the surgery that is before them and to ground themselves. When the surgery is completed, instead of the patient’s lower left leg being amputated the team amputated the patient’s lower right leg. Though statistics vary widely, The Joint Commission, an organization which governs the accreditation of health care organizations, suggests that wrong site surgeries occur 40-60 times in the U.S. each week. Wrong site surgeries are considered to be sentinel events, unexpected occurrences involving psychological injury or serious physical injury or death . The Joint Commission requires sentinel events to be reported and investigated so that the root cause of the mistake can be determined. According to the governing body, breakdown in communication is the primary culprit for wrong site surgeries. 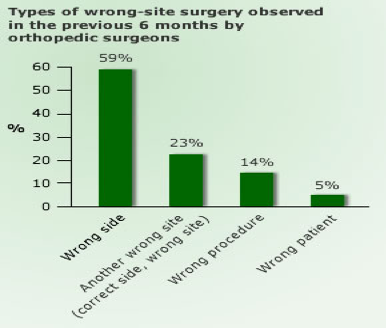 After analysis, it has been found that 85 percent of wrong site surgeries occur because of inadequate planning. 72 percent have been attributed to defects in surgeons’ “time outs.” Surgeon “time outs” are breaks taken before a procedure begins, to ensure that all of the details regarding the forthcoming surgery are correct. 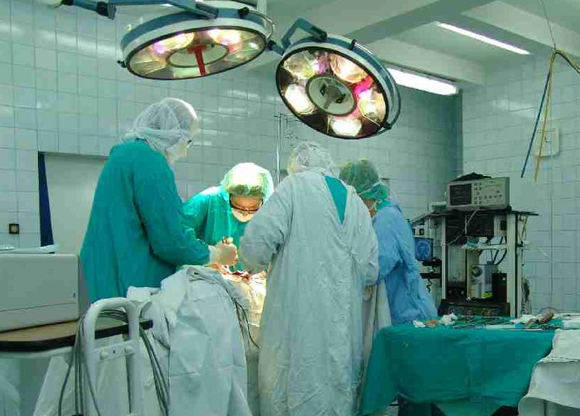 Most wrong site surgeries occur during orthopedic, urologic, and neuro-surgical procedures. Odds of wrong site surgeries increase when the surgery involves multiple procedures. For example, when a trauma patient has multiple fractures, surgical teams may make mistakes on which sites require operation. Despite time outs, wrong site surgeries continue to occur throughout the nation’s operating rooms. Sometimes the time outs simply do not take place, as may be the case in a severely life-threatening trauma situation where minutes count in saving the patient’s life. Other times, distractions arise and make it difficult for the whole team to come together. The phone might ring. Previous procedures may go longer than expected, making some team members later to the surgical suite than would be optimal. Staff may be rushed, moving between procedures, so that not all team members are fully engaged in the time out. In small hospitals that do not have multiple surgical teams, an emergent trauma can require team members to toggle between patients. Surgical suites are generally kept small and cool to facilitate a sterile environment. Exchanging team members after the patient has been prepped and draped has the potential of breaking the sterile environment and is discouraged; nevertheless, it sometimes happens. The new staff may not be fully briefed, unlike the team that was present during the pre-surgical timeout. The Joint Commission requires healthcare to report them and investigate the root causes as to why each of these events have occurred. Medicaid’s decision to deny funding for procedures and care resulting from wrong site surgeries is fairly new. This effectively puts the financial burden of care for these patients back onto the shoulders of hospitals. Despite this further incentive to only perform surgeries on patients that are needed, wrong site surgeries are still one of the biggest mistakes that hospitals make. A brochure published by The Joint Commission is listed in the “Sources” section at the end of this article. The brochure suggests that to help reduce risk of medical mistakes and wrong site surgeries, patients should consult with their healthcare provider before surgery, to make sure that they do not take any medication that will create ill effects during or after surgery. Also, the patient is advised to make sure that markings placed on their body before surgery accurately reflects the body part on which the surgery is to take place. The video below demonstrates the World Health Organization’s (WHO) protocol for conducting a pre-surgical time out. Team members identify themselves, their roles, and the procedure that is going to take place. This procedure has reduced the incidence of wrong site surgeries, though they continue to occur. One Response to "Wrong Site Surgeries Remain Top Hospital Mistake [Video]"